“Love & Affection” is a new stamp set from the Stampin’ Up! Catalogue. If the images look familiar, it is because I’ve used them for other quick cards. 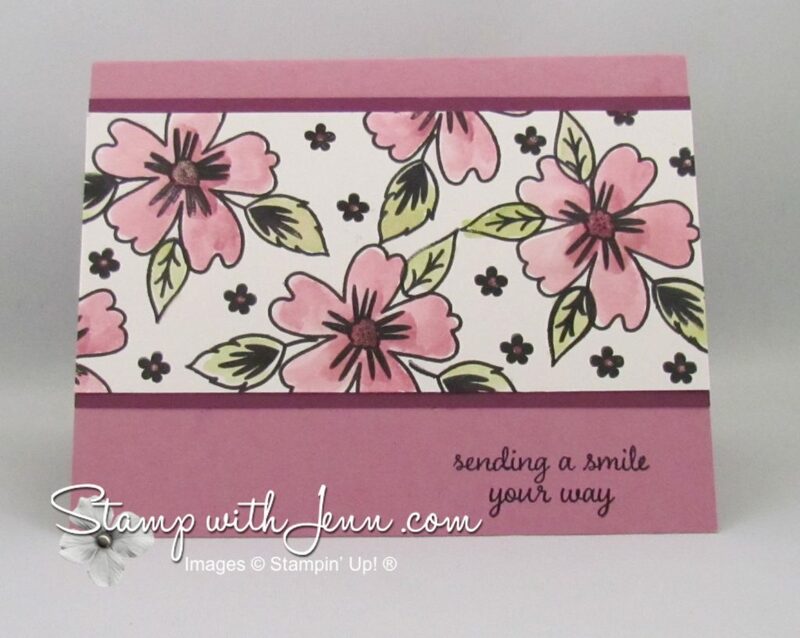 You can see my post using the “Love & Affection” stamp set AND the new ‘In-Colors’ here and here. On this card, I used a super simple design of just a strip of cardstock across the page. I stamped the flowers with Basic Black ink and then used my aquapainter and inkpads to colour the colours. Notice there are no extra embellishments on this card. Just cardstock and ink! The card goes together super easily and quickly. I used the new Sweet Sugarplum ink and cardstock and then also used Rich Razzleberry cardstock and ink (matchy matchy!). The leaves are coloured with Pear Pizzazz ink. I LOVE the new ‘In-Color’ Sweet Sugarplum. The colour is a pretty pinkish purple hue and goes great with Rich Razzleberry. Do you make quick and simple cards too or do you prefer more elaborate designs? Feel free to leave a comment below. I’ll have some more of each this week to show you.